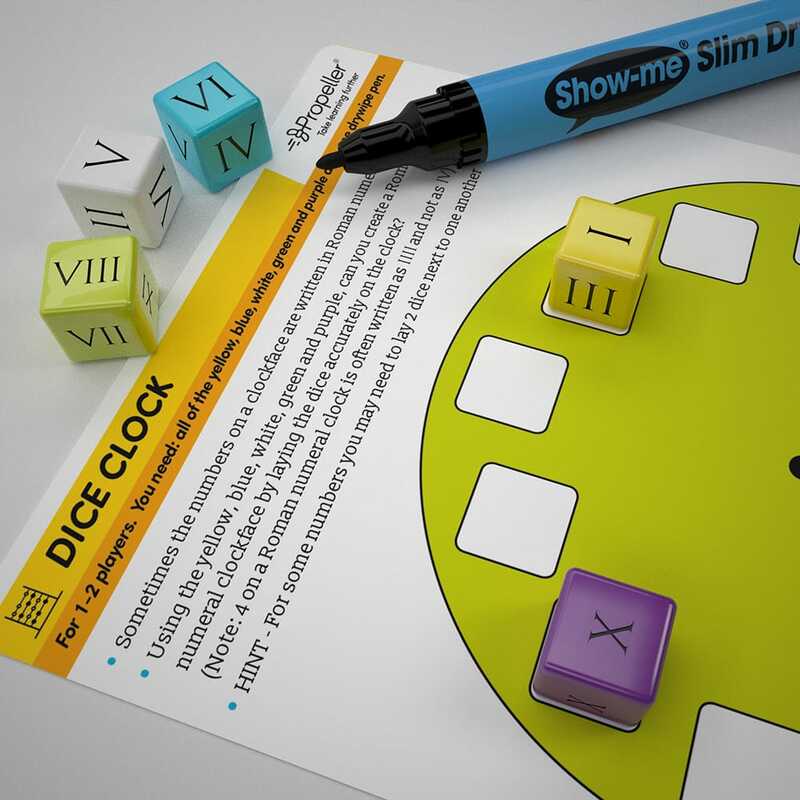 Our 51 piece Roman Numeral Dice Kit supports teachers in delivering the KS2 new National Curriculum Roman numeral objectives. Created by a primary Maths specialist, this kit provides 20 fun games and activities that allow children to explore Roman numerals. The Roman Numeral Dice Kit explores all of the Roman numeral objectives in the new KS2 National Curriculum. Included in the kit are a range of colour-coded Roman numeral dice so that many activities can be played in pairs or groups. Colourful drywipe activity cards provide clear, child-friendly instructions on how to play. Reverse of each card has a handy Roman numeral place value chart. The colourful activities are numbered 1-20. The early activities aim to support children in developing a basic understanding of Roman numerals whereas the later games require a more thorough knowledge. Each kit includes everything you need for children to instantly use the games and activities. Meet every 2014 National Curriculum Roman Numerals objectives with just one kit, and rest assured that your class will develop both a basic understanding of Roman Numerals, as well as a more thorough knowledge as they advance through the games. Activities are numbered 1-20 with the earlier activities supporting children in developing a basic understanding, while the later games require a more thorough knowledge to succeed. There will be a game for everyone in the class. 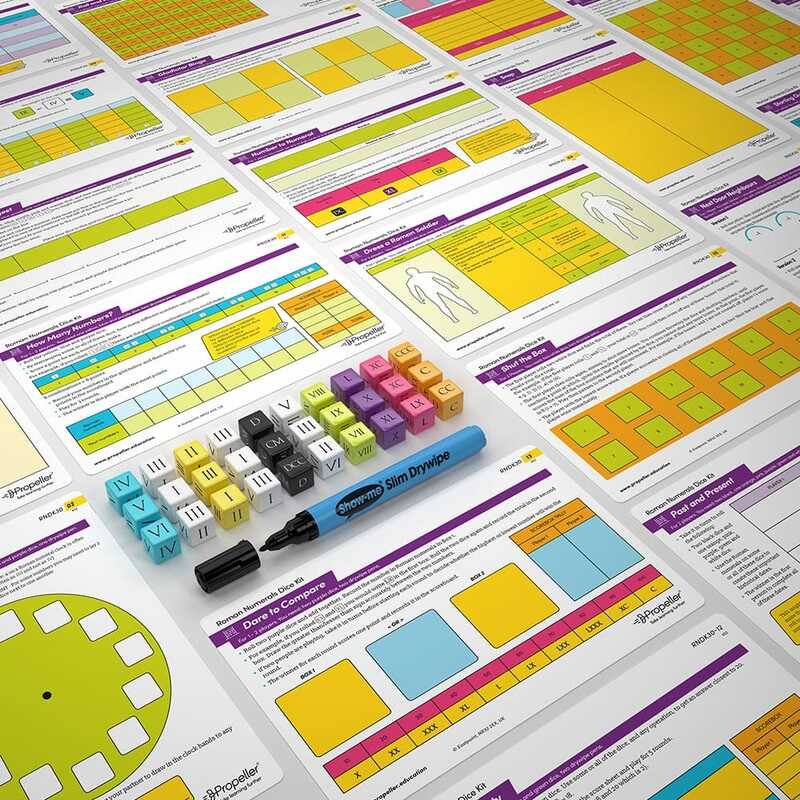 Not only are all the activities included, as well as everything you need to play the games, but the National Curriculum Activity Map card will help you as a teacher navigate the games and what objectives they cover. You can save hours of time trawling the internet looking for the right activity for a lesson’s objective.